Lindsay, otherwise known as LindSlaaay, is a calisthenic athlete, self-taught hand balancer, and overall fitness enthusiast. Originally from South Florida, Lindsay now resides in Los Angeles, California. From a young age, Lindsay has had a passion for movement, spending the majority of her youth as a dancer. As a student at UCLA, Lindsay took up interest in yoga, acrobatics, and calisthenics, combining her love of art and movement with her love of strength and fitness. While living abroad in Sydney, Australia, Lindsay further developed her passion for movement and began gaining attention on social media due to her unique combination of strength, balance, and creativity. Today, she can often be found standing on her hands or playing on the bars at Original Muscle Beach in Santa Monica. Working Out vs. Training vs. Movement: What’s the Difference? 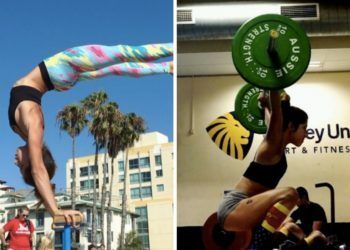 Olympic Weightlifting or Calisthenics? Why You Should Do BOTH! Bodyweight Versus Barbell Movements: Is One Really “Better”?